Prophet TB Joshua of The Synagogue, Church Of All Nations (SCOAN) has emerged from hiding after his failed prophecy regarding the winner of the US presidential elections in November to make yet another controversial prophecy. 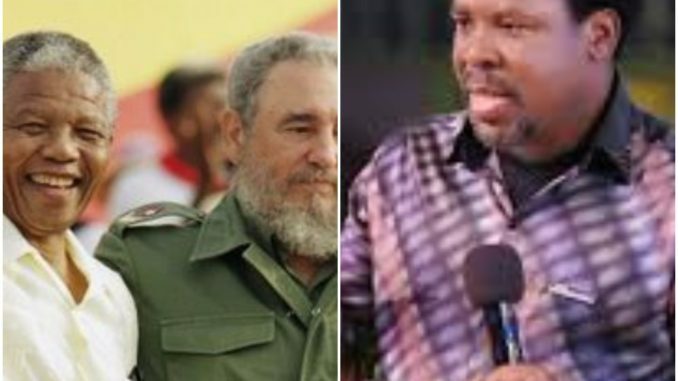 The Nigerian, who was clad in his traditional floral shirt, black pants and black shoes, boldly stated that the late Cuban politician and revolutionary, Fidel Castro, who passed away on the 25th of November 2016, did not make it to heaven. The sentiments was met with total silence in the packed church. “I see a man who died in Cuba. The world is mourning the man as he was a great political figure but his soul is troubled”, T B Joshua said. Fidel Alejandro Castro was a Cuban politician and revolutionary who governed the Republic of Cuba for 47 years as Prime Minister from 1959 to 1976 and then as President from 1976 to 2006. Politically a Marxist–Leninist and Cuban nationalist, he also served as the First Secretary of the Communist Party of Cuba from 1961 until 2011. Under his administration, Cuba became a one-party socialist state; industry and business were nationalized, and state socialist reforms were implemented throughout society. The prophet went on to mentioned many names of people who he saw in hell at it included some of the greatest politicians of all time. He also mentioned Michael Jackson and Brenda Fassie.